A “Norman Rockwell Thanksgiving” suggests a variety of images to Americans. For some, it’s a reassuring message of anticipating a better future in difficult times. For others, Rockwell’s famous painting of a family Thanksgiving tableau is pure paradoxical kitsch. Taking a closer look at the 1943 “Freedom from Want” painting, we observe Grandpa hovering above the scene, perhaps clearing his throat before giving a blessing. Nine other table participants, at various stages in life, are engaged in animated conversation. Grandma is placing a turkey on the table. I wonder, is this a grass-fed turkey from a local organic farm? Do I detect only a few stalks of celery on the table? Is that molded thing cranberry sauce from a (gasp) can? Where are the cornucopias of towering fruits and vegetables, the mashed potatoes with truffle oil? Where are my lattice-laced pies? Where is…. the zinfandel? The painting, for me, is inviting not because of the food, but because the table participants are engaged, happy. At the time it was painted, America was an economically depressed nation struggling through war. How is your table painted? Who are the characters around this hypothetical setting, and what are their expressions? In my painting, a grandchild is sobbing because he doesn’t like the food. My son’s head is bowed in reverence. Not in prayer, mind you. He is texting his friends. In my painting there’s also a bottle of wine. Perhaps two. 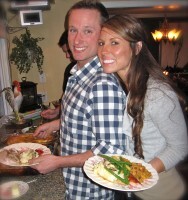 My husband, Richard, and I break tradition by celebrating the Sunday before Thanksgiving. Our children are building their own traditions, and Sunday is the only day everyone can share ours. As for Thanksgiving day “proper,” I simply roast a turkey breast, mash sweet potatoes, roast some Brussels sprouts, and I’m done. 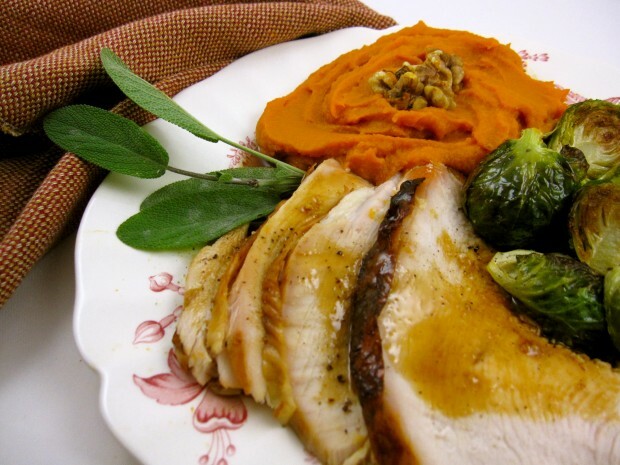 Turkey breasts may be a good choice for your celebration for several reasons. They are easy to manage and usually roast in an hour. Many folks don’t like dark meat. You can circumvent this issue by only roasting a breast. If you’re worried your bird isn’t big enough, roast a breast on the side; they’re also a cinch to grill. And finally, you don’t have to contend with carving a beast. As with chicken breasts and pork, I sometimes brine my turkey breast before roasting. The salt water solution injects flavor and juiciness into the turkey breast. Brining was the culinary darling several years back and grocers had trouble keeping kosher salts stocked. I’ve eaten, however, way too many meats that lost their unique flavor and texture when over-brined. That being said, brining a turkey breast ensures the meat will not be tough and dry, even if slightly overcooked. The message above bears repeating: an extra hour or two in the brine may yield overly salty turkey with a texture of rubber bands. I’d rather eat turkey jerky than an over-brined bird. Double check the turkey breast packaging and ensure it has not been injected with “flavor enhancers” or has been pre-brined. 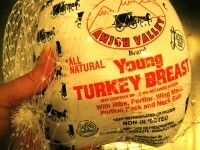 I select an Amish turkey breast which has not been doctored up. The following recipe was inspired by a recipe found in Sunset Magazine. The first time I made it, I ruined the sauce because I was multitasking. I ended up with spun sugar stuck to my pan. When pouring the stock and cranberry juice into the browned sugar, make sure you’ve reduced your heat and have that whisk in hand. If the sauce clenches, keep whisking. It will soon turn into a lovely “jus.” I also added cornstarch to the recipe. To my taste, the sauce was too runny. You may certainly skip the sauce altogether. A traditional gravy is simple, and everyone is happy. In a bowl or pot large enough to accommodate turkey and brine, dissolve salt and 2/3 cup sugar in 4 cups hot water. Whisk or stir until completely dissolved. Add ice or very cold water to make 12 cups brine. (Water should be cold before brining turkey.) Submerge turkey in brine, cover, and chill, turning once, for 16 hours. Do not overbrine, or your turkey will be too salty and rubbery. Lift turkey from brine, rinse well, and pat dry; discard brine. Set turkey, skin up, on a greased rack in a roasting pan large enough to accommodate breast. Brush skin with melted butter. Meanwhile, put remaining 1/3 cup sugar in a medium-sized sauté over high heat. 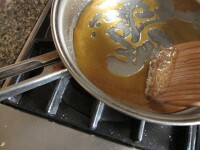 Shake pan often and stir until sugar is syrupy and amber-colored, 2 to 3 minutes. Do not leave sugar unattended. When sugar has just turned syrupy, reduce heat to medium-low. Immediately whisk in 3/4 cup stock and cranberry concentrate; whisk continuously until blended, 1 to 2 minutes. (Note: the sugar may initially harden when stock is added; continue whisking until it liquifies into the stock.) Remove from heat. Stir cornstarch into lemon juice, stirring well to incorporate. Transfer turkey to a platter or board; let rest 10-15 minutes. Add remaining 3/4 cup stock to roasting pan and whisk to free browned bits. Pour drippings through a fine strainer into cranberry sauce. Whisk lemon juice-corn starch mixture into cranberry sauce. Continuously whisking, heat cranberry sauce until boiling; reduce heat and simmer two to three minutes or until slightly thickened. Add freshly ground pepper to taste. Pour into a gravy boat. Slice turkey and serve accompanied with cranberry sauce. *Do not substitute with table or iodized salt.